On the first day of term, my son returns home minus his (new) school bag. ‘I am sure I left it in my locker, mum,’ he tells me. But I can guess from the way he averts his eyes that he’s not sure. I sigh knowing I’ll be on the phone to the Transport for London Lost Property Office on the morrow to find out if a school bag was handed in the previous day. The driver tells me that he had waited until his last trip of the day when the bus was empty of passengers and instead of hurrying to finish his shift, had taken a little detour to return a school bag a boy left on the bus on the first day of school, having looked up our address in my son’s notebooks. In Monsoon Memories, Shirin, a broken wreck of her former self comes to this cold country and is healed by the welcoming warmth of its people. Isn’t it lovely? Ordinary people going out of their way to do extraordinary things and brighten lives. That is what Christmas is all about. Loving, Giving, Sharing. Have a good one, you all, and I will be back in the New Year with news of Book 2. Previous: Indian Fiction: Why Reading is the Perfect Escape. It was lovely and heartwarming to read ur account of the kindness in this season of goodwill and cheer. Brought back vivd memories of when we were near neighbours! ryan and Tanya must have grown up too as has Anusha. Those were ever green times!!! Excellent writing, Renita. It exudes the feeling of warmth implied in the simple acts of kindness of ordinary folk we meet in our day-to-day life. Your narration is so warm .It is so refreshing to know that there are a few good people in this world who go out of their way to help.’The driver of the Red Bus’ .I must mention your Mum’s acts of kindness and love.She is a person who will always lend a helping hand to the old,weak and underprivileged . Thanks so much Aunty for your lovely words. Yes, my mother is the warmest, most generous and selfless person I know- I am so privileged that she is my mum. I hope you had a fabulous Christmas and have a wonderful 2014. It restores your faith in people does that. Lovely to hear and thanks for sharing. Thanks so much Heather. I hope you had a wonderful, relaxing Christmas and I wish you a warm, happy and successful 2014. 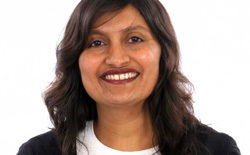 Renita, I had to find out how Reena would come to “understand” what had happened! I stayed in bed this morning to finish the book as I had to find out how you were going to unfold this fascinating story. I can relate to the story in so many ways, knowing the truth, but do not know the why’s, the who’s or have anyone left to ask; just accept and go one with my life and live it the best I know how and give my children all the love and truths I know. I like the foods blended into the story, “food is family” and it grounds the story in those basics of every day life. Also gives us non-Indian people a fascinating taste of India. 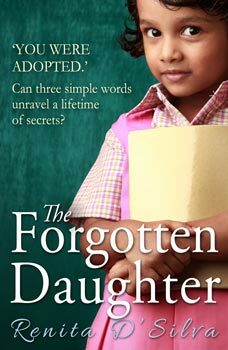 Thank you for writing this book and ‘The Forgotten Daughter’, which I have also read! Can’t wait for your next book! 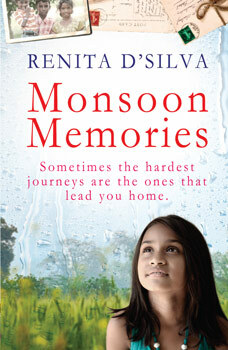 I loved both of your books – I have just finished ‘Monsoon memories’. Like others have said, the influence of food on family life is very heart-warming ….Indian or otherwise! Thank you for writing such wonderful stories! Dear Julie, Thank you for taking the time to write me this wonderful message. I am so glad you enjoyed my books and that the stories resonated with you. Thank you.